The health of all plants depends on intimate interactions with symbionts such as endophytes (fungi that live within plant tissues without causing disease). Endophytic fungi can help defend plants against disease, heat stress, cold stress, drought, and nutrient-poor soils. Many endophytes contain bacterial symbionts -- that is, endohyphal bacteria, which live within healthy fungal cells. These bacteria can modify the way that symbiotic fungi help host plants. Our team has developed a laboratory system to explore how fungal and bacterial partners communicate, and to identify genes and proteins that govern these interactions. Our interdisciplinary research scales from the molecular- to the ecosystem scale through lab- and field components in the climate-threatened forests of the southwestern US. Fungal endophytes form symbioses with all major lineages of land plants, and are common in biomes ranging from the Arctic to the tropics. These fungi are primarily members of the Ascomycota. As a graduate student in the Arnold lab, Dr. Michele Hoffman showed for the first time that foliar endophytes are inhabited by diverse endosymbiotic bacteria (Hoffman and Arnold 2010). These endohyphal bacteria are distinct from the endosymbionts that occur in mycorrhizal fungi and in other fungal groups. Moreover, Michele demonstrated that the bacteria could be removed from fungi with antibiotic treatment, and that they can profoundly influence the production of plant hormones by endophytes (Hoffman et al. 2013). Early estimates suggested that endohyphal bacteria were present in about 35% of the fungal isolates in the Arnold lab's endophyte collection, but more recent analyses indicate that they're present in the vast majority of endophyte cultures. Their phylogenetic diversity was explored by then-undergraduate Jakob Riddle (see abstracts, MSA 2011). These findings led to the MS work of Ms. Kayla Arendt, a graduate student in the Arnold and Baltrus labs. Kayla's work centered on optimizing conditions for introducing endohyphal bacteria into their host fungi after antibiotic treatment; exchanging endohyphal bacteria among fungal strains; and assaying the effects of endohyphal bacteria on enzyme production by fungi. 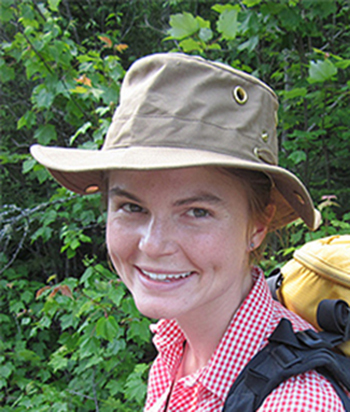 Manuscripts from Kayla's work will be submitted for publication in summer 2015, in collaboration with Dr. Kevin Hockett (Baltrus lab) and Sarah Araldi-Brondolo (Arnold lab). Abstracts of Kayla's award-winning work are available at this time through national and international meetings (e.g., APS/MSA 2013). Together these studies complement a growing body of research in other labs on endohyphal bacteria in diverse fungi, including plant pathogens, root symbionts, and other functional and taxonomic groups. • Aim 1. Determine the phenotypic effects of endohyphal bacteria on endophytic fungi in vitro and in planta. Focusing on key functional traits, we will use cured, resynthesized, and uncured clones of focal endophytes to test three predictions: (a) endophyte phenotypes (thermotolerance, nutrient use, secondary metabolite- and enzyme production, fruiting, efficacy of plant colonization, and effects on plant growth) are influenced by endohyphal bacteria; (b) related fungi natively hosting different bacterial strains will differ phenotypically from one another, but will be similar to one another in the absence of bacteria; (c) phenotypic similarity among diverse fungi reflects phylogenetic relatedness of their bacteria. • Aim 2. Assess the plasticity and specificity of phenotypic effects through tests of host range. Using focal endohyphal bacteria/endophyte symbiota that we have identified previously, we will use resynthesis experiments with novel fungal/bacterial combinations, coupled with phenotypic assessments, to test three predictions: (a) bacterial symbionts and (b) their phenotypic effects are not host-specific; and (c) acquiring novel bacteria will expand endophytes' phenotypic repertoire. • Aim 3. Use transcriptomics to evaluate gene expression underlying recognition, synthesis, and phenotypic effects in a focal symbiotic pair (endophyte 9143 and Luteibacter sp.). Using whole-transcriptome shotgun sequencing of axenic and synthesized partners, we will assess (a) specific responses to direct contact vs. small-molecule signaling; (b) gene expression as relevant to specific phenotypes; and (c) potential targets for genetic responses in host plants, a basis for future work. • Aim 4. Examine fungal activity in the field in the presence/absence of bacterial symbionts. By inoculating living and senescent leaves of the native host plant with cured, resynthesized, and uncured endophytes for which the transcriptomes are known, we will test the predictions that endohyphal bacteria within endophytes alter (a) growth rate, herbivory, and secondary metabolite production (living leaves), (b) degradation (dead leaves), and (c) community composition of colonizing microbes (both leaf types). • Aim 5. Implement an open-source model for data sharing. A project website will combine public access to project content with a portal for project personnel to enhance efficiency, transparency, and open sharing of protocols, scripts, and data.